Paul Casey surprises a young fan named Ronan with a special gift ahead of the Valspar Championship. 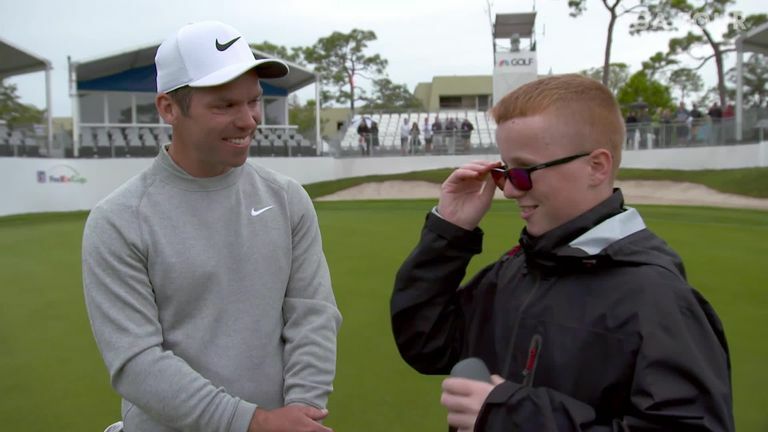 Paul Casey gave one young golf fan an experience of a lifetime with a special treat ahead of the Valspar Championship. Latest news and reports from the PGA Tour. The defending champion welcomed 12-year-old Ronan inside the ropes during a practice round at Innisbrook Golf Resort, where Casey gave the youngster the ultimate golfing experience. After introducing Ronan to his caddie John "Long Socks" McLaren, Casey gave the youngster the opportunity to hit a drive off the 18th tee and take on the final hole of the tournament's infamous "Snake Pit". Better was to come for the child, who was born with colour vision deficiency and struggles to differentiate between colours, after he holed his final putt on the green. Casey delved into his bag to surprised Ronan with a customized pair of EnChroma glasses, designed to enhance how someone views colours, with the youngster delighted with his unexpected gift! Click on the video above to see Casey's special surprise! Watch the Valspar Championship throughout the week live on Sky Sports Golf!